A quick wander around yet another new suburban area in Albany on Aucklands North Shore brought me to an urban stormwater treatment pond. Stormwater, around the world, in ever increasing concrete jungles is a huge polluter to rivers, streams and beaches. 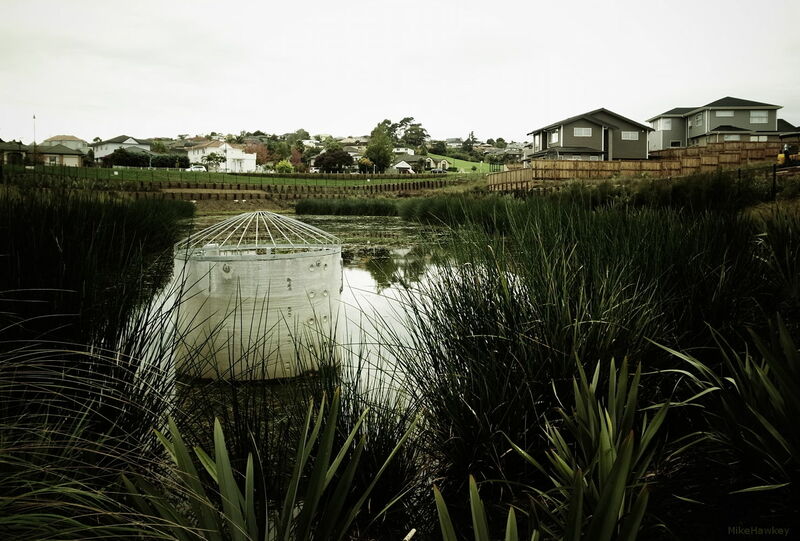 Travelling around different areas of Auckland (and I am sure elsewhere), we have seen an increase in these treatment ponds around built up suburban areas. Designed to remove sediments and contaminants, as well as offering flood protection, the resulting outpour of water is much fresher and healthier for local wildlife. Perhaps not from the perspective in todays shot, they can also add a nice green/lake visual environment around the suburban area (whilst still being off limits to people of course). Shot on the Ricoh GRD IV, switching back to bleach bipass setting. Slightly cropped in Gimp.